coffee attack: I like this photo and the tattoo. Death Proof was a great movie. Too bad the DVD was a piece of squirrel turds. You should see it if you haven't. Also, I love the courier font for that tattoo. 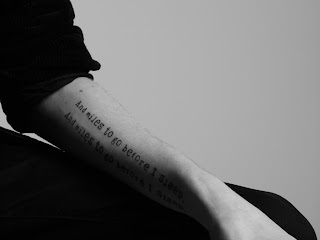 I'd love to get a tattoo of a quotation. I just can't decide what I'd like it to be. I love the font too. I think you should get a quote by Terry about squirrel.